Yee Haw! Trailer Park of Terror is coming out on DVD! I had the pleasure of catching this gem at the Nashville Film Festival this past summer. It is a southern-fried feast of horror, gore, and undead trailer trash!! The film has a true rock and roll sensibility about it, which makes sense as it's directed by Steven Goldmann, who made his mark in music videos, having directed over 200 of them for well known artists such as Bruce Springsteen and Faith Hill. 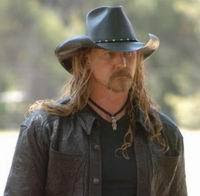 Speaking of well known musicians, country singer Trace Adkins has a role in this movie, too, and really does a fine job as the devil himself. Trailer Park comes out on DVD October 21st. It's based on a comic book series from Imperium Comics. There are two different versions of the movie on the DVD, an "R" rated as well as an uncut version. There are also cast interviews and a "Life at the Trailer Park of Terror" featurette. Highly recommended and three thumbs up from Doc Gangrene!! And why zombies find flesh fine cuisine. One man crazy, many many satisfied spectators! Many thanks, Tim! Really neat poem !! ps - I want to encourage everyone to check out Tim's Videowatchblog - very entertaining and well written blog updated much more regularly than mine!! Join the mad medico and his lovely assistant Nurse Moan-eek as they present a new fright flick every Saturday afternoon at 1pm during September and October. 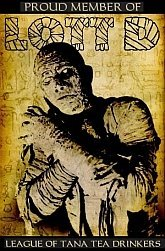 The doctor is celebrating his 10th season as Nashville's horror host, and this season has added a new feature to the films - FACT-O-RAMA! 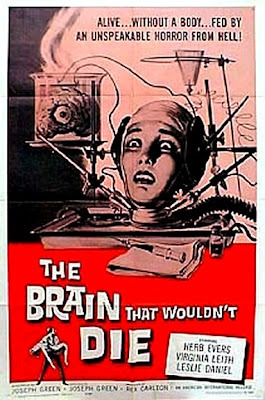 So be sure to tune in every week - the first film in the new season is the schlocky grade z-movie THE BRAIN THAT WOULDN'T DIE, which features a living decapitated head, mad scientist, mutated monster in a closet, strippers and more!! 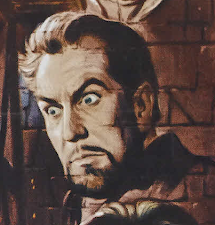 Other movies in the lineup include THE LAST MAN ON EARTH (the first filmed version of I am Legend starring Vincent Price), WHITE ZOMBIE starring Bela Lugosi, Hammer films' THE HOUSE THAT DRIPPED BLOOD starring Peter Cushing and Christopher Lee, and the horror classic NIGHT OF THE LIVING DEAD.